Do you get bored of seeing the same wallpaper every time you use your iPhone or iPad? If yes then we have got a fun and useful tweak for you called WallCycler. The tweak has been developed by Ryan Petrich, which allows users to have a fresh wallpaper every time they press the lock button and unlock their device. Using this tweak is very simple as it integrates well with the native ‘Wallpapers & Brightness’ settings of iOS 7. 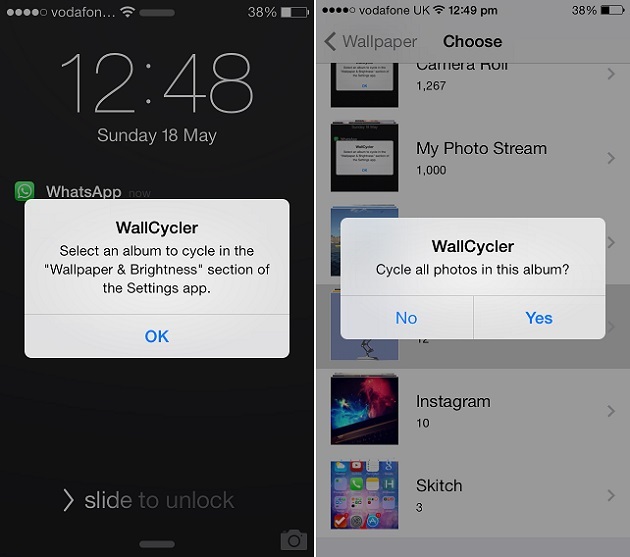 WallCycler enables users to select any album from settings. Then this tweak cycles around the wallpapers stored in that particular album. It applies the same wallpaper on both homescreen and the lockscreen. A new wallpaper is applied right when you press the lock or home button to unlock your device. The same background is kept until you lock and then unlock again. In our opinion WallCycler is a much better way of having different background than the tweaks which add a different wallpaper image for each homescreen page. But of course at the end it all depends on your personal preferences. To select an album you have to install the tweak from Cydia then head to Settings > Wallpapers & Brightness > Choose Wallpaper. From there you have to select the album of your choice. You can download WallCycler from Ryan Petrich’s Cydia repository for free.